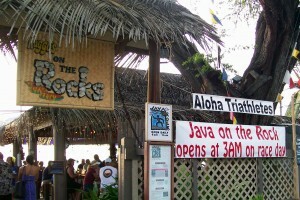 Ironman Championship Week Kicks Off & Huggo’s is at the Heart of the Action! We're welcoming athletes and their families from all over the world this week at Huggo's and Huggo's Rocks! We took to the streets yesterday, camera in hand, so we can share some of the many sights of the 2011 Ironman Championship — as if all the lean, buffed bodies in town aren’t enough to signal this year’s event is here, these banners, signs and artwork confirm it! Race day is Saturday, October 8 starting with the 2+ mile swim, followed by the 110+ bike, and finishing with the marathon length run. The official action begins this evening with the “Parade of Nations” along Ali’i Drive. All week long we’re hosting “Breakfast with Bob”, the online video talk show, featuring elite athletes, including Aussie defending champion Craig Alexander who is going for his third consecutive win this year! “Aussie, Aussie, Aussie”! Check out the videos on Triathlon.Competitor. com and follow every day for an insider’s look at the action. Click here to view Alexander’s interview with Bob: http://triathlon.Competitor.com/2011/10/video/crowie%et%80%94as-fit-hes-ever-been-for-kona 40797. In the meantime, enjoy these snaps while we kick back and enjoy some of Chef’s ono fish tacos for lunch at Huggo’s on the Rocks! Gateway banner approaching the start and finish line for the 2011 Ironman Championship at the Kailua-Kona Pier. Get a lasting memory of this year's event with an official Ironman Championship "tat". Look for this banner at tatoo artist studios located in Kailua-Kona Village. Tri-athletes Gert Fischer, Left, and James Kimberley, both from Cologne, Germany, with local artist Cindy Coats' 2011 Ironman Championship commemorative giclee print! Defending Champion Craig Alexander training on Hawaii Island this week.